So today my Apple TV (2nd Generation) turned up, and I have to say I’m pretty impressed. Anybody who knows me or has been reading these my post, will know that over the last couple of years, I’ve become an Apple fan boy I’ve gradually replaced my MP3 player, my phone, my PCs and even my entire network with Apple products, and as time has gone by, I’ve organised my entire music collection to be “iTunes friendly”. 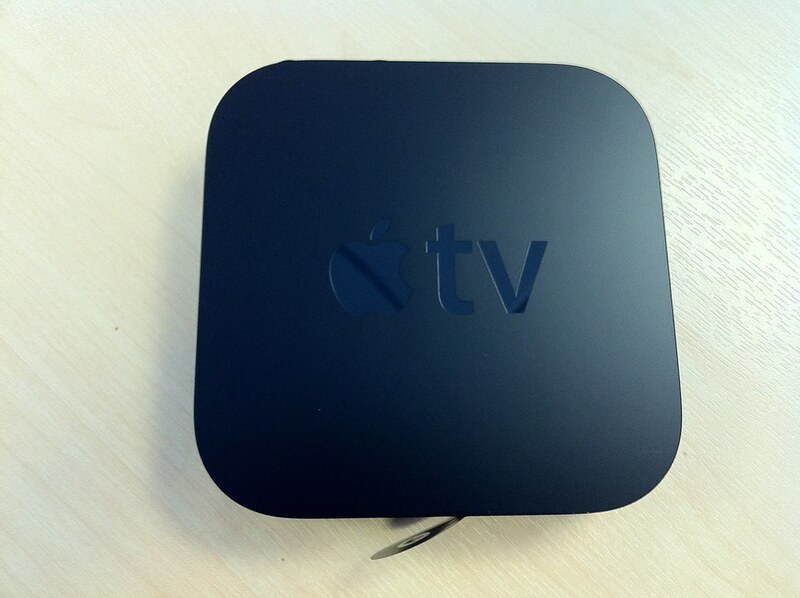 I’ve been toying with the idea of an Apple TV for a while now, and very nearly bought one of the 1 generation ones about 2 months ago. I’ve been using a piece of software on my MacMini called MediaLink, to stream my iTunes content to my PS3, which to be honest has been working pretty well, apart from the fact that it won’t play DRM media. So the announcement was made early in September that a new Apple TV would be out shortly, so me being me ordered one. So what’s it like ? Now this is the first time I’ve used an Apple TV, so some of the features I’m raving about, might have been in the first generation. 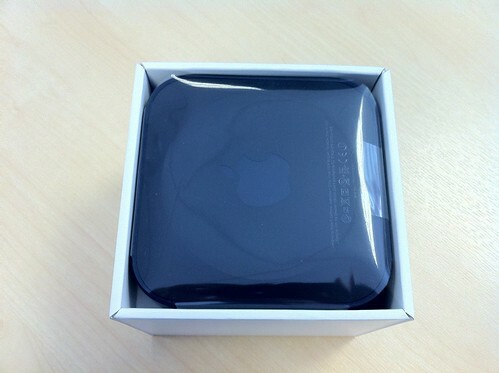 First of all, it’s size, this thing is tiny, it literally fits in the palm of my hand. The device has a very small white light on the front, the flashes with the remote press. 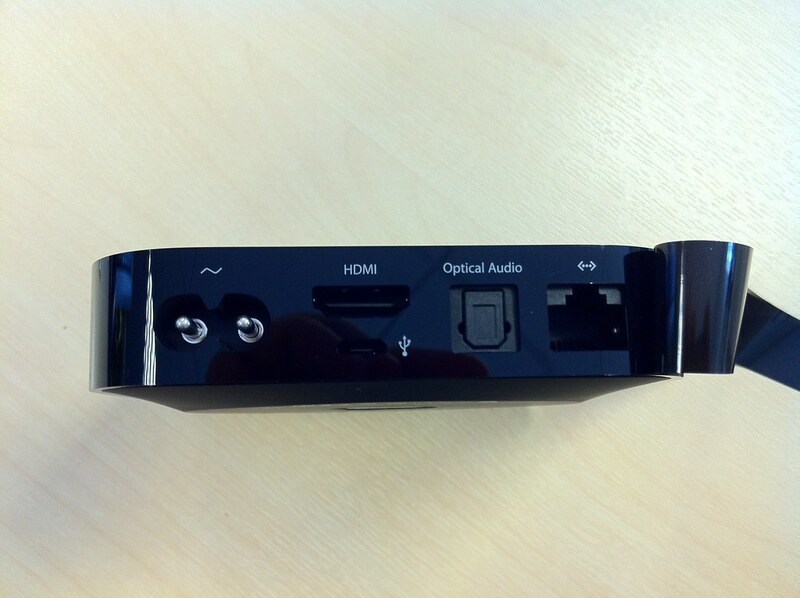 The rear has a USB port, a HDMI port, power port and an optical output. Setup, as with any Apple product was painless, plugged it in, selected my language, added my apple ID and that was it, good to go. 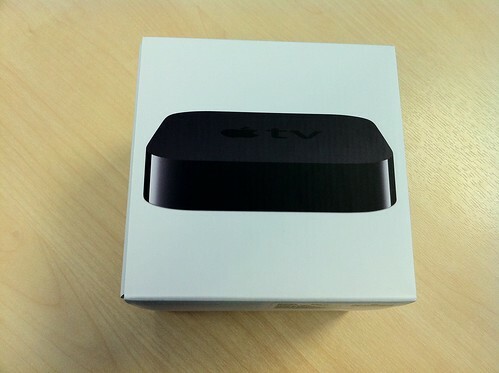 So what is an Apple TV ? The main menu gives you a few options. Movies, and then the sub menu of Top Movies, Genres, Search and in Theaters. The “in Theaters” option was essentially what you get on Apples trailer site, all the trailers for whats in the cinema right now. The next tab is Internet, with the option of YouTube, Podcasts, MobileMe, Flickr and Radio. The Youtube option will allow you to sign in and see your subscriptions. The podcast option does what it says on the tin, it opens up the content as found in the iTunes store and splits them into Audio, Video or all. You can then “add to favourites”, which will let you know how many unwatched episodes you have, it also remembers your position which I thought was a good feature. I don’t have a MobileMe account, but assume if I had, I would be able to stream from this. The Flickr allows you to subscribe to public users and view their content. I can’t see a way of signing in, as this would be perfect as I’m a Flickr pro subscriber and have my entire photo collection hidden online, it would be nice to be able to access these. Finally there’s the radio, which is the same content as the Radio tab in iTunes. The next tab is Computers. Basically any machine that you have iTunes on (version 10 or above) with Home Sharing enabled, you can stream all you content from them. 2 interesting features in the settings are the AirPlay, and Remotes. The Airplay allows you to use the Apple TV as an Airport Express, and the Remote option allows you to use you iPhone as a remote control. As your probably aware, the iPhone remote app has recently been upgraded to support the Apple TV. The app works with gesture controls, swipe left and right for fast forward and backward, tap to pause and play, and the godsend was being able to type in when searching. There is also flick up to get to chapter, and 2 finger left swipe to roll back 10 seconds, you can even move the onscreen content using this ! The AirPlay is pretty cool too, now granted, to play media from my Mac by selecting Computers > Mac Mini > Music > Album > Play or I also have the option to connect to my MacMini via the Apple Remote app, select the Album > Play > select the Apple TV as the speakers. This will not only output the audio to the Apple TV, but it will also display the album art and ID tag of the track being played. Now I subscribe to a lot of podcasts, and it’s nice to see that if I’m looking at my Computers library, I then watch or listen to a podcast, this syncs back to the library. There was nothing more annoying than watching something using MediaLink, then having to Screenshare onto my MacMini to mark them as watched. This seems to be the same for Movies and TV too. So far I’ve very happy with this device, and I guess I’ll be spending the next couple of months converting all my DVD’s to mp4 format and adding these to my iTunes library. 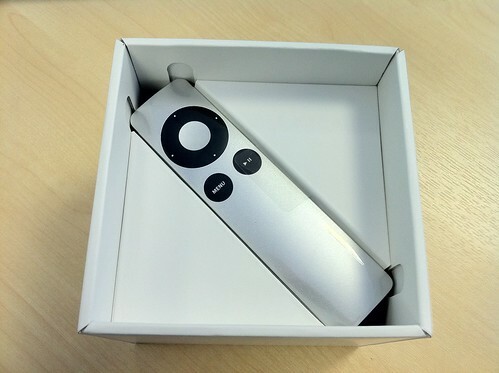 For anyone who uses iTunes for their media content, and if you have a spare £99, I suggest getting one of these. 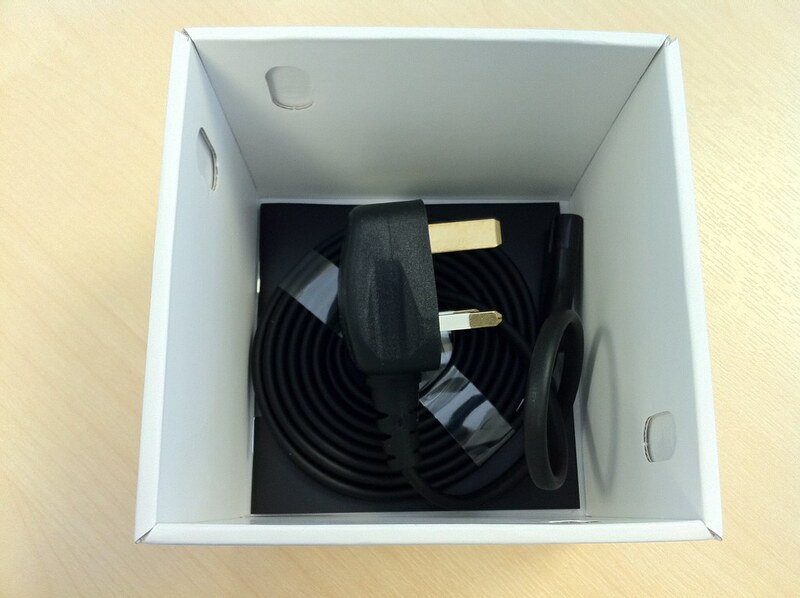 As always, unboxing photos are below.